This is a great post. I agree that somehow people think of raising children as the biggest thing they've ever done, and so if you're not going to be raising children, then perhaps you need to do something amazing yourself. Which is a lot of pressure and not fair. A life doesn't have to be bigger just because it's not shared with little humans. I am not a no kidder, or at least I am a temporary no kidder, but I get this. And now people keep telling us "what a wonderful thing" we're doing with pursuing adoption. Which is kind of untrue, because while it's wonderful, sure, we are not in it for the saving of children and the glory of being selfless saints. Far from it. People's expectations are weird. Live that life, it's a beautiful one, and as big as you want it to be. With or without kids. I absolutely agree with you and Jess. Too often, people assume that having kids = life satisfaction. And yet there is so much data that shows this is far from the case. Having kids doesn't make one more complete in life just as not parenting doesn't make one's life any less. It's all about the person and how they chose to live. Looking forward to hearing about your next big/small thing. Ohhhh, with your description of escape , to far away, i immediately remember my own 'plans': my big thing was going to an orphanage in Africa and cuddle babies. And I was going alone. I was so Angry that I did not even feel my relationship had any value(!) The existence of stepchildren had everything to do with that, I could not face a future where he had kids and I was on the side line. Yes, yes, and yes...I felt pressured to find the next big thing at first, but then I realized my world was so grey at that time and I was bleeding so much inside that I just didn't have the energy to do so. So what I did was try to find small things that brought me joy and that's helped a lot, especially over time as they've started to accumulate. I felt the same pressure to do something big. I also felt the same desire to run away. I did both by leaving my last job and putting all my focus on my current job. When I didn't get a promotion this year, I went into a level of despair that I've never experienced before and I know it's because I was dealing with double grief (no baby and no career at the level I wanted). I thought about running away from my current job and reinventing myself but like you say in your blog, you can't run away from yourself. Or as I say, "no matter where you go, there you are." Like you said in your blog, I'm trying to find joy in the little things. My niece shared with me her favorite quote is from Mother Theresa to help me: "We all cannot do great things, but we can all small things with great love." That has been my focus the past year. I will be 50 next year, and doing better, recovering. Your blog was comforting to read that I am, once again, not alone in this. Love your writing, please don't stop. 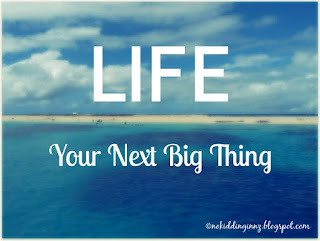 Life being the next big thing is such a profound thing after infertility. I enjoyed reading your post about this and everything you say here is very true. I think I would be the type that says, "What's next?". I'm still in the trenches but I've been thinking a lot about this very thing as the time draws closer to closing that door once and for all at some point in the near future. There are a lot of things I never explored (but dabbled in a little) in my pursuit for a child and I know those things, whilst not big as such, are things I would very much like to explore further and deeper should it turn out that parenthood is not on the cards for us. This is so timely! I think I'm largely through the survival phase and I'm itching for the next big thing. I don't know what though. I've spent the bulk of the free time in my adult life focused on schooling and/or too broke to have hobbies. So now that I have both the time and the money I don't know what to do with myself. Beautiful ideas here, Mali, and in the comments as well (loved the Mother Theresa quote). I am reminded of a few eulogies I've heard recently here in the U.S. about high profile men taken too young. What stood out the most was the emphasis on their caring natures. Both were referred to as being a "good man" ... A seemingly simple concept but a very powerful one. Thank you for this. The idea that we must do something "big" with our childless lives -- whether that idea is self-inflicted or suggested by others -- has long been a bit of a pet peeve of mine. What's wrong with living a happy, ordinary life (if there is such a thing, lol -- but you know what I mean). The idea that we need to do something grand to 'compensate' for our lack of children really bugs me. If you want to, fine, but nobody should feel obligated. I really like this post. It comes at a good time. Thank you! I saw in myself the pursuit of the big, as I was contemplating the loss of something so huge to me as being a parent. So I love this: "I haven't found my next big thing, but I've found lots of satisfaction doing a lot of next small things." So wise. This was helpful, Mali. Though it's great and much needed on a level to hear that people come out of this well, it's not an easy concept to connect with while immersed in grief (as you pointed out). 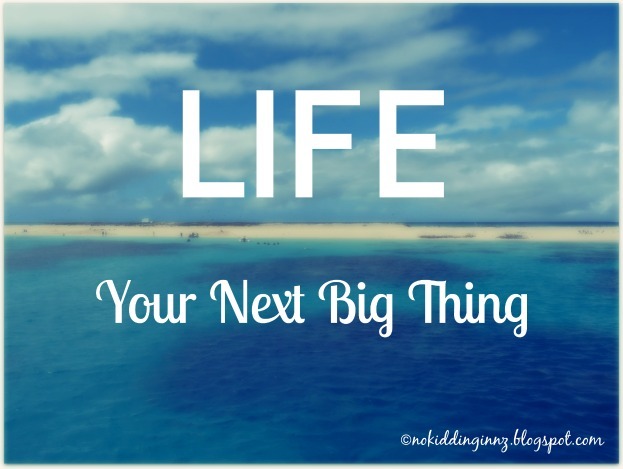 I often find myself in a tug of war between wanting a "next big thing" to fill my void and the common sense that nothing, at least at this time, will. And I grapple with my ego thinking it needs a next big thing to justify myself and the wiser part of me knowing I'm enough no matter what. For me it has been a bunch of untimely self inflicted pressure coupled with a lack of energy and caring - not doing much good for myself with that! This post really enforces the wiser and more realistic side of things as I continue to put one foot in front of the other. I love your amendment also. Surviving has become so normal to me I forget it is a big thing. And so is grieving well. So I just wrote a post about this very topic and BentNotBroken recommended I read this again. Yes yes yes! I'm glad I'm not alone in this, the pressure is certainly real. For me, it is a mixture of internal and external pressure, but mostly internal if I'm honest. I do try to take a lesson from my hubs, who has always known that he would be OK without kids and doesn't feel any need to fill up the void from our loss, but it feels like such a big loss to me. It is also, however, exhausting to always wonder what's next. For the first time in my life I'd like to give myself permission to just enjoy what is, but it's hard. Mali - It has taken me two months to come to this post after you commented on my blog. I just wasn't ready. Your insight is incredible! It has only been 3 years since we stopped trying to become parents, so I know I'm still in the healing process. I think I'm doing ok, then something happens that brings emotions back to the surface. The next big thing is grieving well.